"@simonebiles is the best American gymnast since, well, probably ever. Although she's just 4 feet 9 inches, with size 5 feet, there's an unfathomable amount of power packed into her petite frame. The 18-year-old #gymnast flies through the air as if she were part bird and part cannonball. 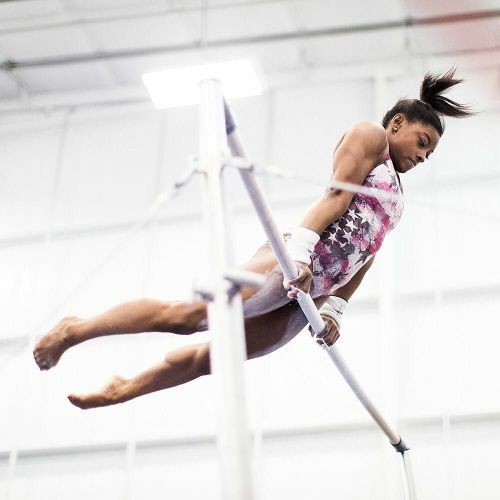 @simonebiles insists that she's just like any other teenager, but she's not. She was identified as a prodigy when she was 6. She even has a signature move named after her: the Biles, a double flip in the layout position with a half twist added at the end. You'll see it soon enough. The @nytvideo journalist @leslyedavis photographed @simonebiles practicing at her parents' gymnastics facility in Spring, Texas. Visit the link in our profile to read more about the gymnast @nytimessports calls the favorite to win the all-around title at the @rio2016 Games." By nytimes on Instagram.